Stock your bakery with this dependable D&W Fine Pack G40-1 10" 2-3 layer cake display container! It includes a large, black tray and a secure, snap-on dome lid that's tall enough to accommodate 2 to 3 layer cakes up to 10" in diameter. Not only does the clear lid provide superior product visibility and fast identification, it will also help to boost impulse sales of your colorful, skillfully-crafted cakes on display. The D&W Fine Pack G40-1 10" 2-3 Layer Cake Display Container with Clear Dome Lid is great for packaging and displaying cakes. The secure snap on lid keeps cakes fresher than the standard cake box. We use these in our bakery for to go cakes. Although a bit spendy, still cheaper than our local suppliers. Quality seems to be the same or better. These cake containers are solid. The only issue I have is releasing the top once the cake container is sealed....it's a bit tricky. The flip side of that being that once the top is on, it is SECURE! These cake display containers provide durability in transport of cakes. They also provide clear visibility to the customer and others of the product at hand. These cake containers are very useful and helpful when I did a cake show. It allowed the customer to be able to view the cakes. They also kept the cakes pretty and was easy to transport. Love, love, love these! They stack and store easily AND the lids are perfectly crystal clear so you can see our gourmet treats neatly inside. I use these to package my cakes, They are durable and very sturdy, I have never had an issue with any item from here. i would order again. These cake domes make packaging dessert cakes quick easy and affordable. The dome lid seals tightly so it keeps the cakes very fresh and safe. Omg! This cake containers have totally changed the way my cakes look. These containers are very sturdy and clear just as the description says. My customers look this look compared to the box containers I used to use. I will be ordering more soon to restock. Great quality product! They are nice and sturdy containers. They give all baked goods a more professional look. They keep baked goods nice and fresh for longer shelf life. Oh, please don't let me forget about the price! I really love the prices here at Webstaurant! They are well stocked with all products to suit my wide variety of baking needs. They have great products. Their delivery is always quick! If you have any issues they are quick too at resolving those issues. I love these containers. I use them to ship my pound cakes all over the country. Keeps my cakes fresh when either shipping them or delivering them locally. This is one product I can't live without. Perfect size and excellent material I like it a lot !!! The cake Looks exelent and cute, beautiful and clear at first watch amazing ! Have been ordering these trays for past 3 years, excellent for our retail business. they are very durable and provide highly visible surface for our products at a reasonable cost. Absolutely the best!! These containers are great. The clear dome gives you the visibility to show off your masterpieces. The size is a perfect fit for the eight or nine inch cakes. I love them. This cake containers are very easy and convenient to use for layered cake. I normally bake 3 layer cakes and there is plenty of room inside so the cake doesn't touch the sides of the container. This carrier also make the cakes look professional. Love this container! worked PERFECTLY! securely holds cake and keeps it fresh. very durable and great for transporting cakes with out them getting messed up! definitely will be ordering more. 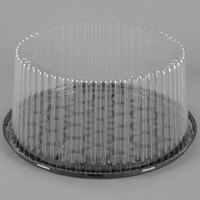 This clear cake container is very sturdy and perfect to show your cakes off with. Also keeps cakes/cupcakes and other desserts fresh. I love the clear look! These are more than I expected! They're very sturdy, and kept my cakes moist, even with a bit of rough handling. I will definitely buy again. Love these cake containers. The high dome is perfect for 3 layered cakes. They close securely and are easy to open. Will definitely reorder in the future. This product is reasonably durable. It can be a little difficult to close/open at times, but I would say that i am satisfied overall with this cake container. HI, IM HERE BECAUSE A FRIEND TOLD ME ABOUT THIS AND I SAW THIS CAONTAINER IS REALLI GOOD QUALITY! GREAT FOR MY OWN BUSSINES! I REALLY LOVE IT! These cake containers are firm and safely keep my cakes fresh and sealed. I do recommend you use the cake circles with these. I ordered those from here as well. I really like this high cake container. I've made high blueberry chiffon cake and used this container to give it to my sister. This container is very sturdy and well made. I purchased these to use for selling cakes at farmer's markets/vendor fairs. Love how customers can see what they're buying without having to open a box. I have had ordering this size for a couple of years now, and they always arrive on time and never any delays, but for the product itself, there is noting on the market today that comes close to the satisfaction I get from using G40-1 10" Cake Display. I bought this because it has a clear dome. I like to use it for tall birthday cakes, and tall cupcakes with sugar cookie toppers. Great presentation. Love these! It seals in freshness, presents our sweet treats perfectly. We deal with a lot refrigerated items and these containers hold up nicely in the refrigerator. These containers are a great option for dessert cakes. The clear dome allows for clear viewing of the product and seals well to protect the item inside. These containers do work great for cheesecakes with tall toppings. However, I do wish the clear plastic lid wouldn't crack so easily. I have to be very careful removing it. Crystal clear cover is perfect to display your work. The size is great for many different type layer cakes...sturdy container, but also easy to open and re-close. I will definitely reorder! These D&W Fine Pack G40-1 10" 2-3 Layer Cake Display Container with Clear Dome Lid - 10/Pack are easy to use and make your cakes stand out. Great price. These display containers make displaying our cakes and pies easy! They are also useful for transporting cakes and pies! They are sturdy enough for even the densest cakes! LOVE, LOVE these cake containers!!! Very sturdy, sufficient, presentable, and good for travel. No more buying those flimsy cardboard cake boxes from the other store. Best cake displays ever. My customers love these and it keeps cake soft and most. Cakes travel well without being broken or crumbed. Will purchase again. Love thses containers!! They reall show off our homemade pound cakes. Our customers comment on our packaging all the time!! Thank you fir all your great products !!! Our bakery loves these containers. Great for displaying our beautiful cakes and baked goods. Keeps cake fresh and ready to eat. These are our go-to container. These cake containers are very welled made. You can put your heavy cake in. Carry with confidence & ease. It in returns gives your cake that final touch of perfect presentation. Price is fair. Absolutely love the cake container. I successfully was able transport these cakes in style. Great quality. Wasn't too flimsy very sturdy . Made my cake look professional rather then homemade. Great price the the quantity which is very competitive. They packaged these to eliminate any damage and it worked, i received mine in good conditions. They are high enough for my layer cakes. Love theses will re- order. These cake containers were used to transport several cakes I baked for church as well, they can be reused and the price of them was very affordable. Just received shipment today and I'm very happy with this item. Just the right height and very sturdy and the right fit for my product. Will definitely reorder again. I am so glad I have come across your web site I just love it!!! I love these products for my home made goodies so much easier to use and delivered really quick!!! Thank you for making my life easier!!!!! I love this container and it fits the 10inch board snuggly, so there is no sliding. I will warn of 2 things, getting the lid off after putting it on is hard! and 2 use a 10 inch board no matter what cake size or else use tape to hold it down. These are the best trays to transport cakes. The secure lip on the bottom if the tray keeps it from sliding around and messing up the decorated side of the cake. Great cake dome haven't used the new shipment yet but they look sturdy enough to keep my cakes safe!!!!?? I wanted a taller one to make sure frosting would not get damage. I must say, I like these containers. This website seems to be a lifesaver because I have been wondering where to get certain products that I've found on here, definitely 2 thumbs up! I have searched high and low for a plastic dome with an inside height to accommodate my 3 layer cakes. This is perfect as it gives me enough space so my decorated tops are not destroyed. This are the best for me I can use it in cakes and desserts with out have to worry about the product I really love it. My costumers are happy because they can carry easily and the presentation of my products are awesome. These are great for cheesecakes and also for smash cakes for kids. Makes transporting both a breeze with the clear top. Also the lid locks on TIGHT! This item is as described. I purchased it in conjuction with the gold corrugated cake circles. I would highly recommend this item to others looking for a good cake bottom. This dome fits Securely. It allows your baked goods to have a Professional finish. I am so happy with this purchase. Great Product Webstaurant Store. These cake containers are great. They fit a cake that is a little over 5 inches tall. They are very sturdy and we will be buying again. Good container for some of our grab and go cakes! They are decent quality for the price and protect the cake from the outside elements. I love this cake carrier for my 9 or 10inch decorated cakes. There is no slipping of the cake and the lid fits snug for care free transport. i use these for my 8" cakes. It makes it easier for me if there is extra buttercream work on the sides of the cake that I want to ensure isn't smudged. Perfect fit for 10" corrugated cake circles. Has fit every cake I've put in it, probably up to about 6" high. Keeps things nice and airtight in the fridge, easy for transport. Very professional. This product is exactly what I needed to be able to package my cakes. The dome fits tightly to keep the cakes fresh. A few were damaged when delivered (cracked along the edges). It can be difficult to separate each dome from the others, but considering everything, it's a great product! Love these disposable cake trays. Can't find them anywhere else. They fit our 9" 3-layer cakes perfectly - without a cake board. They look professional too and allow customers to see what's inside. In my opinion, they are even better than cardboard cake boxes because you can see through them. Love them and will continue to buy them from the Webstaurant Store! I love that there's no assembly and it's super sturdy. Just pop the lid in place and it stay's put without even using a cake board with it! I have a small home based cake business and it's nice to have an option to buy just 10/pack case. Very nice looking and sturdy containers. Help me to present the cakes to my customers professionally. Keeps the cakes fresh and secure. I am returning happy customer of The Webstaurantstore. Love these dome cake containers with lids. Perfect for church bake sales or school functions. They are perfect and hold up very well. Thank you !! This cake tray is surprisingly very sturdy. I used to deliver a two-layer 8 inch cake. The clear lid displays the cake well. I also appreciated the fact that the cake did not slid. All the frosting remained intact! love these containers they hold my cakes an pies for freshness 2-3 days when using the boxes they dry out quicker, so that's way I use theses . These are great for my tall cakes. Since I operate a small home bakery business I also like that you can order the containers ten at a time instead of a whole case since I do not have a lot of room to store containers. The cake trays have been great for my business. With a cake board inside, the cake will fit perfectly in the tray without messing up icing. The are also nice to have on display in the bakery case while keeping the product moist. This product is excellent. The honeycomb base provides excellent structure for carrying, especially when cakes are filled or heavier. The high lid provides plenty of space for decorations. I was having a small problem with cake circles sliding on it, but I found that getting a non-slip, non-adhesive shelf liner, and cutting a little 2" square bit, to put onto the cake board - the cake will hold rock steady after. This is my second order of these. They work great. When I sale a cake, that securely fit and has enough room, for the cake to breath, makes me happy! I absolutely love being abe to order this item at such a great price and fast shipping. It's a great product. I am a returning customer. These cake domes were fabulous, after searching, and searching we found them to be the most affordable and very durable. ..love them will definitely order again! Ordered minimum order to be sure of quality before I ordered more. Received items, quality is great! Will be placing larger order. Perfect, beautiful display for my "gift " cakes. Items were packaged carefully and shipped promptly! These containers are so easy to use for over sized cake easy to carry the cake stay in place, you can use a board or just place the cake on the tray. I really enjoy using the 10" cake tray because it is a high quality container and it fits well with the 8" cakes I make. It also works well with my own decorations that I add to make the cakes look like a gift for my customers. These are a perfect size and just what we needed to ship our cheesecakes. They keep them protected and provide a extra layer of security during shipping. Sturdy and attractive. We sell our ice cream cakes in them. The quality is very good. We will buy more for sure, probably in a large quantity to save money. I absolutely loved the quality of these containers!! They worked out great for my Christmas Bake Sale!! Keep the cakes moist and my customers loved them too!! My cakes are larger than normal, but this cake container worked perfectly. It allows for the cake to travel well during delivery as well as make your cake be seen without people having to open a box.. very essential for your bakery. I bought these to make sure i had enough room for a 3 layer cake and plenty of frosting/decoration. Depending on how much frosting you use, I typically use a 2 layer cake instead, just so i don't damage the top of the cake. These containers are great for transporting my cakes. They keep the cakes fresher than cake boxes, and allow the customers to see their cakes without opening the containers. Very durable. The 10 inch cake tray and with lid is sturdy and held up well while I made deliveries. I used it for a 9 inch cake with 3 layers and it fit perfectly. I love these containers! They are very good quality and help keep the cakes fresh and secure. My customers love them and often reuse them! Ordered these for use at our church bake sale ... they work beautifully with the 10" rounds. They're perfect for take away orders on our 9" layer cakes. Very pleased with their durability and the price. This cake tray and lid display is the best way for us to display our ready made cakes in the case to prevent them from going stale, but allow customers to see the cake completely. These containers are sturdy and the lid is crystal clear for displaying our beautiful cakes. A 3-layer cake fits perfectly in this container on a 9" cardboard round. The first pan I received was not molded properly and leaked. Webstaurant quickly replaced it. The replacement pan works great. Very impressive customer service! Thank you. Every week, I drove across town to purchase cake trays. My friend told me about this Webrestaruant site. After visiting the Webrestaurant, I immediately noticed the cost was totally different at least half the amount I paid in the store. I am please with the product and stability. My cakes always looks professional and fresh. OMG! I wish I found these earlier. They are great and cakes fit perfectly. They are very sturdy and the price is unbeatable. THANK YOU! The domes are the right size for a 9" bundt or decorative round cake! The material is just a bit thinner than I'd like, but overall, they worked fine for packaging my cakes. Love these! We couldn't do business without them. It is THE container that we trust our scratch-baked triple layered cakes to ship across the country. I use these to sell an occasional cake and also for bakesales at our church. It makes a very professional look at a reasonable price. When I bring a cake I've made in one of these containers, everyone asks if I bought it. Not because it LOOKS that good, but the packaging takes it up a notch. And no need to worry about getting a Rubbermaid (and expensive) cake carrier back. Though, if I've just brought a cake to the office in this, I've taken them back home and washed it and gotten another use or two out of it. Very sturdy, protects the cake beautifully. Just a lovely presentation. Love these 10" containers. I take them to events with me, so when somebody buys a full cake I use these instead of my fancy cake boxes! a 9" cake fits perfectly and locks tightly. This product is ok for certain types of cakes, a little flimsy and you have to be careful not to break it. I do still use it for certain types of cakes though. I think these trays are awesome for picnics or outtings where you want to protect your cake. It makes it easy for adults and kid to remove and replace the cover. These cake containers are priced lower than buying individual ones from the local GFS. The 10" tray is the perfect size for pound and layer cakes. These containers are awesome and are perfect packaging for my decorated sugar cookies that I do. They hold up so well and hold a lot of cookies, my last order was 5 dozen and they all fit inside the holder with room to spare. I love this container. It holda a three layer cake great and it holds up very well. It is a great price. Wouldn't go no where else to get this. I love being able to see the cake I am presenting. These containers are sturdy and travel very well. The height is great for those Three layer cakes with thick frosting! They were perfect. I was able to make cakes for different occasions and i did not have to worry about when I would get my cake plates returnned to me. I purchased these cake containers to replace the previous cake boxes that I used. They are very economical and it allows your customers to see their product. Very happy with these. I have ordered the cake display containers with lids in the past. I will be making a future order for the upcomming holiday season that will include this product. These containers have been very helpful. They allow us to better display our cakes and are easy to use. It does take extra storage space but it's worth it. I prefer these to cake boxes because they keep your baked goods fresh longer especially if you have to keep them longer than a day. These 10 inch cake display containers are amazing. i simple love them, great for transporting and displaying two and three layer cakes. Must have product! These cake trays/containers are great for transporting cakes or even for storing them without fear that they will get ruined! Great price and very sturdy containers! I love this product. I have been purchasing similar items from my local grocery stores but sometimes they can't be sold. I love using these containers for displaying cakes and other desserts I make. I so glad I found this product online. I absolutely love these containers. I use them for my cupcakes and tall cakes. The are very light and they are easy to pack. I highly recommend this product! They display your baked goods with class. I had been looking for a cake holder that would hold and display my larger (3 layer) cakes without messing up the frosting. The cover and bottom are very sturdy. This was perfect! The Wilkinson 10" Cake Tray/Lid Display Container is perfect for products with 2-3 layers. Customers are able to see the product without contamination issues and thanks to the closure of the container my products do not dry out as quickly as in many other containers...VERY GOOD THING!! I ordered these containers very late on a Friday night, and they arrived at my door by the following Wednesday! My cakes looked great and were very easy to transport. I'll definitely reorder. Perfect way to give the gift of a delicious cake! I used to purchase these cake containers at party stores until I found these at WEBstaurant. I enjoy the convenience, and the price is much less than I used to pay. Just what I Needed. They are the right size and I received them in good time. The customer likes them it bets plastic wrap. Great Job.